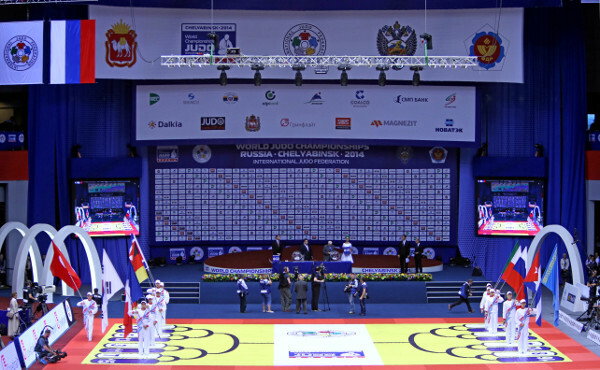 Three world titles were at stake as champions were crowned in the women’s +78kg category and the men’s –100kg and +100kg categories in front of a capacity crowd of 8,000 fans. 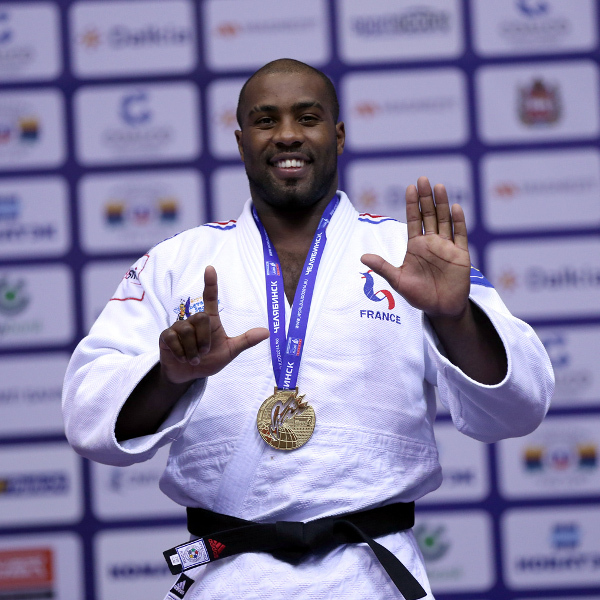 Olympic champion Teddy RINER, who is unbeaten since 2010, was unsurpassable yet again as he won an incredible seventh senior world title with a narrow win over a game SHICHINOHE Ryu (JPN) in the +100kg final. Fellow Olympic and reigning world champion Idalys ORTIZ (CUB) was able to rediscover the formidable form which earned her the aforementioned titles having struggled for results in 2014 including an early exit at the first Havana Grand Prix before her home fans. 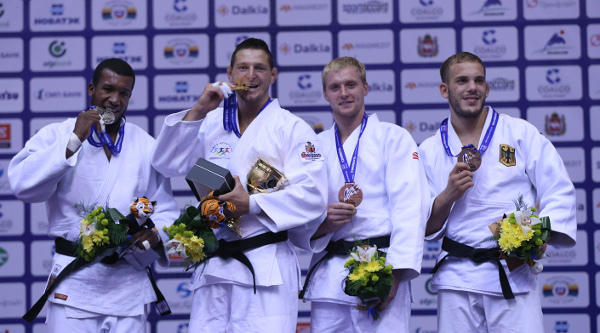 European kingpin Lukas KRPALEK (CZE) made history as he won his country’s first world judo title with a superb display which showed his wide repertoire including his pinpoint ne-waza which is regarded as among the best in the sport. The Best Male Judoka Award for the World Championships went to RINER who just keeps getting better and better and all his victims know that at 25 years old, there is still more to come from him. 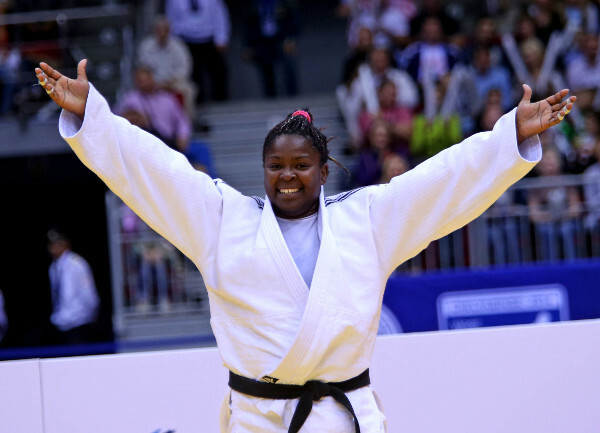 The Best Female Judoka Award went to ORTIZ who won all four fights by ippon. In the end five 2013 world champions repeated their win from 12 months ago as RINER and ORTIZ followed -52kg winner Majlinda KELMENDI (IJF), -66kg gold medallist EBINUMA Masashi (JPN) and -70kg champion Yuri ALVEAR (COL). 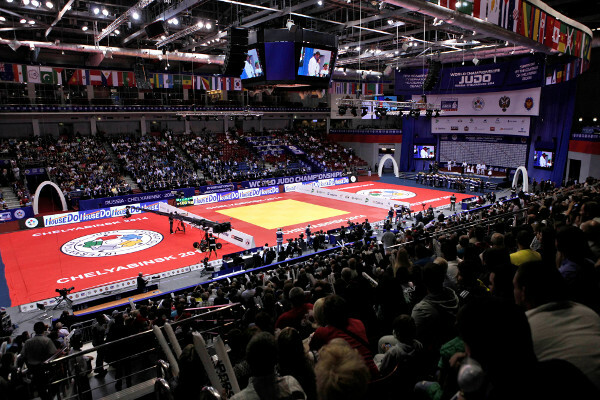 The World Championships is set for a thrilling finale as the team competition brings Chelyabinsk 2014 to a close on Sunday with 16 men's teams and 16 women's teams set to give their all for their country in the hugely exciting format in which Georgia (men) and Japan (women) are the reigning champions. After six days of pulsating action, Japan finished top of the medal table with four gold, two silver and three bronze medals. This year’s 14 gold medallists come from 10 different countries, the same number as last year, while 24 countries claimed a medal this year. There were question marks about Olympic champion and world champion Idalys ORTIZ (CUB) coming into Chelyabinsk 2014 having produced a host of toothless displays on the IJF World Judo Tour this year. 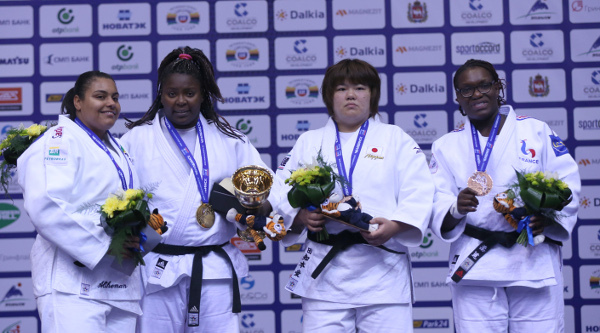 However, ORTIZ, 24, is a big stage performer and there was no lack of motivation this time around as she defeated long-time rival Maria Suelen ALTHEMAN (BRA) in a repeat of the 2013 outcome at the summit of the +78kg category. ALTHEMAN does not have the answer to the problems posed by ORTIZ on the tatami as she suffered her eight head-to-head defeat against the Cuban from eight meetings. ORTIZ won by ippon with a devastating ura-nage after 71 seconds and punched the air as any sense of self-doubt around her ability evaporated. 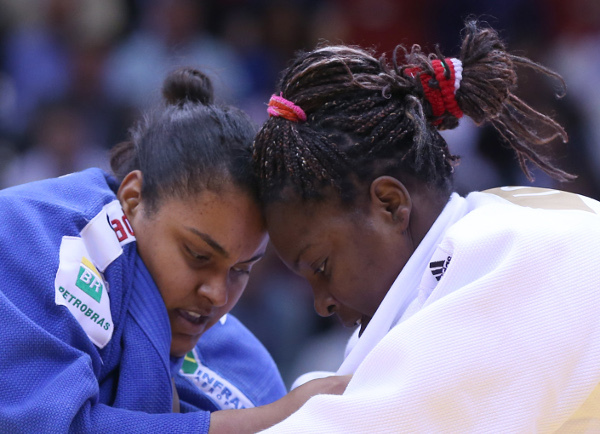 The Cuban ace also showed the judo values off the tatami as she helped the injured ALETHEMAN onto the medal podium after the Brazilian picked up a knock on her ankle during the final. In the first semi-final ORTIZ overpowered European champion Emilie ANDEOL (FRA) in golden score as she initially held down her challenger before securing the okuri-eri-jime to force the Frenchwoman to submit. In the second semi-final ALTHEMAN saw off three-time wold bronze medallist TACHIMOTO Megumi (JPN) on shido penalties. TACHIMOTO attacked with harai-goshi but had insufficient power behind it to unsettle the considerable frame of ALTHEMAN. The Japanese judoka was penalised twice for passivity while ALTHEMAN was penalised once for the indiscretion and went through to the heavyweight final. The first bronze medal was won by TACHIMOTO who rallied with 12 seconds left to counter a sasae-tsuriomi-ashi effort from 22-year-old European bronze medallist Jasmin KUELBS (GER) with a harai-makikomi for ippon. The second bronze medal was clinched by ANDEOL who somehow found a way to deny three-time European bronze medallist Franziska KONITZ (GER). ANDEOL was lethargic through the four minutes while KONITZ had more purpose but offered a minimal attacking threat so the contest went into added time. Only three more seconds were needed as ANDEOL scored waza-ari from an ouchi-gari in the very first attack of golden score. European champion Lukas KRPALEK (CZE) won the Czech Republic’s first world gold medal with a convincing victory. World number one KRPALEK, 23, a two-time world bronze medallist, showed his rich development over the last year by coming out on top against the best of the best in Chelyabinsk. KRPALEK bested former Junior world champion Jose ARMENTEROS (CUB) who was a big surprise in the -100kg category after a superb breakthrough on the elite senior stage. KRPALEK is well-known for his ne-waza prowess and trapped his Cuban opponent with a tate-shiho-gatame for 20 seconds and, with his jacket undone as a result of his horizontal endeavours, he stood up and raised his arms up to shoulder height in his trademark celebratory pose. In the first semi-final KRPALEK knocked out Olympic champion Tagir KHAIBULAEV (RUS) and erased the memory of being one of the Russian’s victims in London when he got caught in ne-waza. KRPALEK took out Russia’s last hope of an individual gold medal by a single shido penalty which was handed to the Russian for negative gripping one minute into the contest. In the second semi-final ARMENTEROS bested fellow surprise package and Tbilisi Grand Prix silver medallist Ivan REMARENCO (UAE). Both judoka had won all their previous fights by ippon so something and someone had to give and that was REMARENCO who was thrown for ippon after 34 seconds with a sumptuos morote-seoi-nage. ARMENTEROS fell down to his knees and placed his hands on his head in shock before shaking the hand of IJF President Mr. Marius VIZER and Cuban Judo Federation President Mr. Rafael J. Manso REYES as he left the field of play. The first bronze medal was won by REMARENCO who defeated Tyumen Grand Slam bronze medallist Martin PACEK (SWE) to win his country’s second medal in Chelyabinsk. REMARENCO sealed a place on the podium at the expense of PACEK, who still produced Sweden’s best finish in Russia, by catching him with shime-waza to yield to force the Swede to tap out. 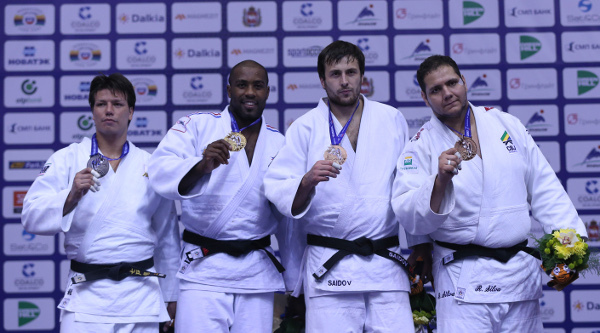 The second bronze medal was won by Ulaanbaatar Grand Prix silver medallist Karl-Richard FREY (GER) who defeated KHAIBULAEV which caused some discontent in the crowd as their understandable frustrations were evident. The German ended his country’s six-day wait for a medal by scoring a yuko and showing a solid defensive game to hold out the revered Russian. 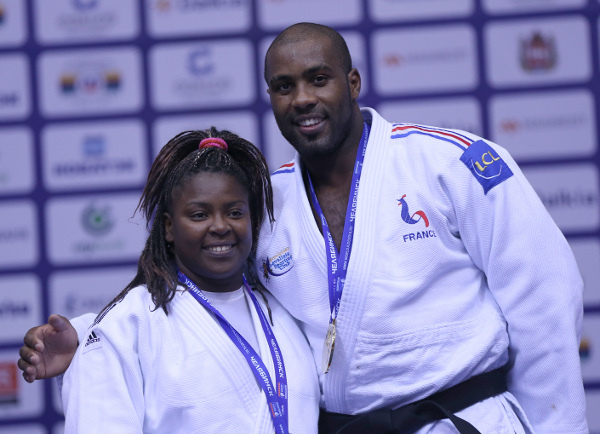 Olympic and six-time senior world champion Teddy RINER (FRA) won his seventh senior world title at the age of 25 to equal the all-time number of world gold medals set by TANI Ryoko (JPN) and TONG Wen (CHN). RINER, whose four-year unbeaten run extends to 62 fights, was trending worldwide on Twitter as he won every fight via a different method in a masterclass which left the crowd in awe. 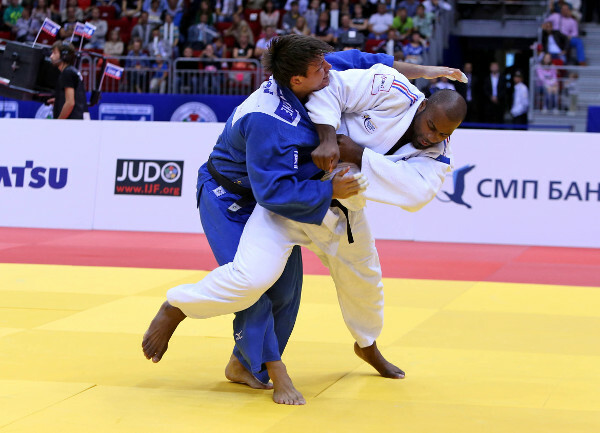 RINER defeated a game SHICHINOHE Ryu (JPN) who came to fight and gave the Frenchman more resistance then he is used to. Paris Grand Slam winner SHICHINOHE attacked with a hopeful ouchi-gari after 40 seconds which did not register with the unmovable French force. The Japanese fighter went on to receive a shido for passivity and two for false attacks as RINER urged him to stand up and fight. SHICHINOHE sprung a ouchi-gari on RINER and had the heavyweight phenom backtracking as he just managed to turn and land on his hips to avoid what was close to being a yuko score. RINER, who used osoto-gari, uchi-mata and koshi-jime to earn ippons in the earlier rounds, saw out the remaining time to lay claim to being one of the greatest of all time. In the first semi-final RINER made quick work of his 2013 world final victim and Olympic bronze medallist Rafael SILVA (BRA) as he subdued the Brazilian with shime-waza without breaking a sweat. In the second semi-final SHICHINOHE downed the man he beat to win the Paris Grand Slam, and his first IJF World Judo Tour gold medal, in the form of the impressive David MOURA (BRA). The latter was caught flat-footed as the Japanese countered an ouchi-gari for a waza-ari score. SHICHINOHE booked a place in the final by scoring his second waza-ari as a ko-uchi-gari sent MOURA into the repechage. The first bronze medal was won by Havana Grand Prix winner Renat SAIDOV (RUS) who dismissed MOURA to win Russia’s eighth and final medal of the individual competition. MOURA tried to execute a drop seoi-nage but slipped back and Chelyabinsk’s own judoka SAIDOV held the Brazilian down for 20 seconds with a minute remaining. SAIDOV went over to hug teammate and Olympic champion Mansur ISAEV (RUS) as well as mixed martial arts legend and former Russian judo team member Fedor EMELIANENKO. The second bronze medal was won by SILVA who defeated rising powerhouse Roy MEYER (NED) in a scoreless contest as the Dutchman was penalised for passivity to hand Brazil their fourth medal.